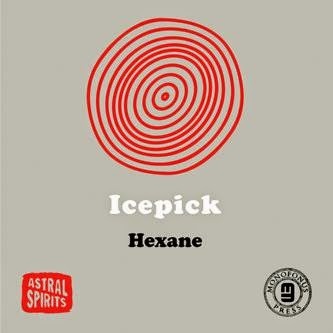 A new trio named Icepick with Nate Wooley on trumpet, Ingebrigt Håker Flaten on bass, and Chris Corsano on drums! Sounds pretty cool, right? And for the most part, it’s indeed very nice. “Hexane” consists of two long, unstructured tracks that display the trio engaging with freely improvised, audacious, and exciting music. The opening “Pentane”, the more subdued of the two tracks, starts with screeching noises from Håker Flaten & Corsano. The noises, ranging from subtle and quiet to aggressive and loud, underline a sense of building tension. The musicians use this kind of abstract attunement to create further soundscapes, pumping more and more energy into the music. Meanwhile, the sounds become more comprehensible and coherent, even when the tune briefly resembles a swarm of bees or when it starts relying on rumbling, contracted rhythms and repetition. Surprisingly, there are moments during which Wooley explores pleasant melodies in his approach and spices them up with nice phrasing. There’s some exciting, furious improvised stuff to be found here. The other track, “Heptane”, is purely fierce and mighty. It rolls out full of intensity and power right out of the gate and maintains the tension for most of its duration. It only dwindles momentarily during certain segments. At times, I felt so inclined to dub this style “industrial jazz” because of some of the expressions that the players pull from out of the hat. One niggle worth nothing is tied to a few ideas that come out a bit uncooked and unfinished, surely just the result of the musicians still experimenting and getting to know each other. Yet, this doesn’t detract too much from the music. What does detract is the subpar sound quality that makes the record a bit difficult to enjoy. Even if the album was recorded live (in Brooklyn), the production level is definitely not good enough and it clearly tarnishes the band’s artistic vision. The instruments sound distant and obfuscated, almost as if they were mushed together. The stereo panning is quite often also amiss, with faint, barely hearable sounds focused into one channel, distracting the user from the music. It feels as if only one microphone was used to record the show. “Heptane” is somewhat better recorded, but this also exacerbates the constant noise coming from the audience which keeps chattering and clanking, coughing, etc. It is sad that many subtle and exquisite nuances and soft dialogs go unheard. To some this raw quality to the release might present a peculiar appeal, I guess, but I’m left wondering. Is the sound as it is on purpose? Is it part of the performance? A potentially provocative idea that might be worth musing on. While the technical problems encountered on Icepick’s debut make the output of these magnificent musicians fall short of the “album of the year” category, this is still a very promising start for Icepick. Since a hard copy might be impossible to come by at this point (the album was released in a very limited cassette-only run), anyone interested will have to grab the digital version (which should still be available). All in all, there’s enormous potential within this new group and I can’t wait to hear what they do next. Available digitally at all the usual spots. And some tapes may still be available here.